Lou Conper was 20 years old and a sailor aboard the USS Arizona when it was attacked on Dec. 7, 1941. 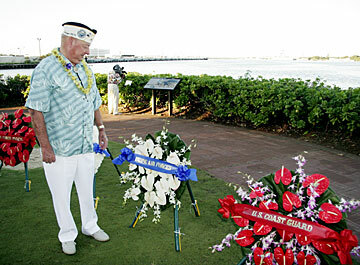 He attended a memorial service yesterday at Pearl Harbor. AMERICA OWES a debt of gratitude to the Pearl Harbor generation, especially the reservists and National Guard soldiers who fought in World War II, the uniformed head of the U.S. Navy said yesterday. Speaking at the memorial service marking the 64th anniversary of Japan's Dec. 7, 1941, attack on Pearl Harbor, Adm. Michael Mullen also paid a special tribute to U.S. Sen. Daniel Inouye, who served in Europe as a member of the famed 442nd Regimental Combat team. Mullen, the chief of naval operations, said Inouye was a teenager when the Japanese attacked, and volunteered his services to tend to civilian casualties. Mullen recalled Inouye's "character, courage and confidence," which led to him being awarded the Purple Heart, Bronze Star and Medal of Honor. During his speech, Mullen also asked the 20 Pearl Harbor survivors in the audience to stand and be recognized. He said their presence bore witness that those who died during the Japanese attack did not perish in vain. Mullen said the Sept. 11, 2001, terrorist attacks brought the country together as the Dec. 7, 1941, attack did. In his short address, Inouye said, "We must always remember our history, and while there were painful lessons learned, it is a source of inner strength and spirit. We should not allow that torch to be put out." Inouye has attended all but two Dec. 7 observances since 1954. Ken Swedberg, who was a crew member on the destroyer USS Ward, said, "Every time I go to the memorial, it gives me a choked-up feeling when I think of the sailors who are still entombed there and never had a chance. They are the real heroes." Swedberg, who is president of the association called First Shot Naval Vets, was a gunner on the 3-inch anti-aircraft gun on the Ward on Dec. 7. He witnessed the United States' first shot of the Pacific War when the Ward attacked a Japanese minisub trying to enter the Pearl Harbor channel that morning. At 7:45 a.m. yesterday, with the white Arizona Memorial as a backdrop, Kahu Kamaki Kanahele and Kahu Kauila Clark opened the ceremony with a Hawaiian blessing. Following a moment of silence at 7:54 a.m., four F-15 Eagle jet fighters from the Hawaii Air National Guard flew over the memorial in the missing-man formation. Several minutes later the Pearl Harbor-based destroyer USS Chafee, which just returned from a six-month deployment in the Persian Gulf, passed the memorial as the Pacific Fleet band played the national anthem at the visitors center. The crew of the Chafee, in their white Navy dress uniforms, stood at attention and rendered honors as the audience watched from the visitors center about a mile away. For the first time in 25 years of observing the anniversary, there was only one memorial service at Pearl Harbor. In the past, the early morning ceremonies, which always include a moment of silence at the time the attack began, were held at the memorial that sits over the sunken battleship USS Arizona and at the U.S. National Park visitors center. This year, the two services were combined at the visitors center, partly because a large group of Pearl Harbor survivors and their families planned to attend. At the conclusion of the nearly 90-minute ceremony yesterday morning, Pearl Harbor survivors laid wreaths before the visitors center memorial honoring the eight battleships that were sunk during the attack. Afterward, Mullen, Inouye, Pearl Harbor survivors and their families were taken by white shuttle boats to the memorial, where they presented floral orchid tributes. Each guest dropped a flower into the well of the memorial, with some of them presenting a hand salute.